Having sweated our way through France, we've arrived safely in Switzerland and are having a fantastic time with my sister and her family. We spent the first part of the holiday at their lakeside home in the village of Concise. 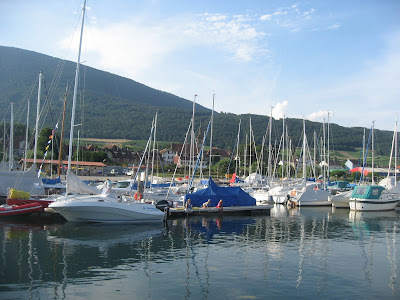 It was a great opportunity to relax, enjoy the views of the lake and explore the village. And everywhere we went we noticed this familiar sight. It looks just like our recycling bin from home, but with yellow chevrons. I think this could start a new trend...Forget Pimp my Ride...Pimp my Bin is where it's at. Anyway, before I get distracted with thoughts of Lawrence Llewellyn Bowen and Andy Handy decorating wheelie bins all over the land, I'd better get back to the business of these blue and yellow bins. It turns out they are to encourage people to recycle PET bottles, i.e. those that are marked with a number 1. Rumour has it, they are all over the Swiss canton of Vaud and can be found both at leisure hotspots and on the streets! Recycling on the go...I love it! The landscape in Vaud is pretty varied. The canton, which is the equivalent of a county, stretches from the lakes in the valleys up to the great heights of the Swiss Alps. It is the 3rd most populated canton in Switzerland and the fourth largest geographically. Apparently the tranquil and gentle lifestyle over here has, in the past, attracted international celebrities to make their home in Vaud, including Charlie Chaplin, Ernest Hemingway, Igor Stravinski and Audrey Hepburn. These days you're more likely to see Phil Collins, David Bowie, or Michael Schumacher. I just hope they remember to use the bins whilst on their travels. David Bowie could sing Zeroes whilst throwing in his bottle! Admittedly, Schumacher will have to slow down to take his aim ...and if he doesn't quite hit the mark at least Phil Collins can rub it in with a cheeky performance of I Missed Again. Back in Bury St Edmunds, it's more a case of singing Take Me Home, but not for much longer as on-street recycling bins are planned for the town centre. Hooray! It looks like there's a new trend hitting the streets! So wherever you are on holiday, whether it's the UK or overseas, check out the local bins and see if you too can recycle on the go! You may be pleasantly surprised! In the meantime we've headed over to the Alps, where we're spending the rest of our time at great altitude. We really are in picturesque Chocolate Box territory. But the question on my mind, is how easy will it be to recycle that chocolate box? I'll ponder that one with yet another bar of Toblerone. 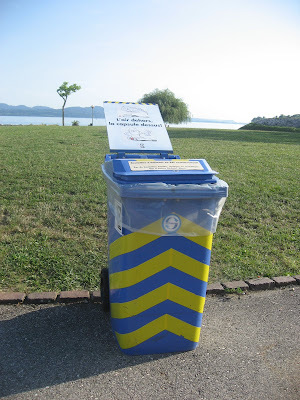 Good to hear you've arrived safely in Switzerland, Mrs A.
I think the 'recycling on the go' bins are a wonderful idea/ I know they are trialling them in parts of the UK, but I really hope they take off and become a regular landmark across the country.